Jim Gifford used to stand “like a monument,” frequently present on the corner of Elmwood and South avenues, Sean Kirst said. His house was the second on the right up the South Avenue hill from that intersection. Kirst didn’t really know Gifford then; he just recognized him. Then, Gifford wasn’t at the corner anymore, victim of a murder early one morning. It happened in 2013, right by the intersection where he so often stood, just after he bought his breakfast inside the old 7-Eleven at the corner of Valley Drive and South Avenue. That 7-Eleven is closed and covered with wooden boards now. But one Saturday in October more than 20 people gathered for the fifth-annual commemoration of Gifford’s life. A year after the murder, Kirst organized a cleanup of the streets in and around Gifford’s intersection. The first year, Kirst wrote that more than 100 people showed up. While the number has declined in the ensuing years, the memory of Gifford and his commitment to his community has not. Kirst, a longtime Post-Standard columnist who now writes for The Buffalo News, wrote multiple times about Gifford’s murder. A teen, Romeo Williams, jumped the 70-year-old Gifford in the 7-Eleven’s parking lot and punched him before returning to kick him while he lay helpless on the ground. It’s at that very intersection that people gathered on Oct. 6 to remember. 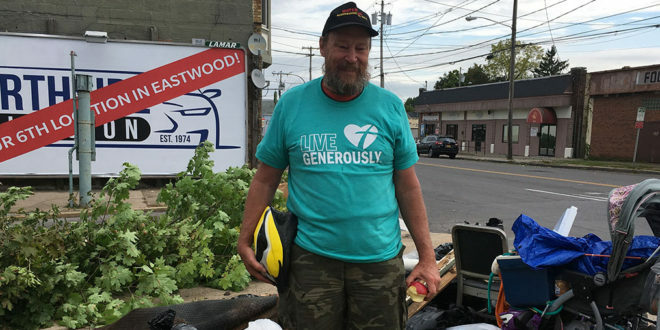 On Saturday morning, Dougherty, one of the event’s organizers, was parked in the old 7-Eleven’s parking lot by 8:15 a.m. His navy-blue Pontiac Vibe had its trunk open, ready to provide supplies to anyone who showed up to help clean. There were black garbage bags and wooden pickers, akin to large tongs, to grab garbage off the ground. One of the first arrivals to clean was Pat Hageman. 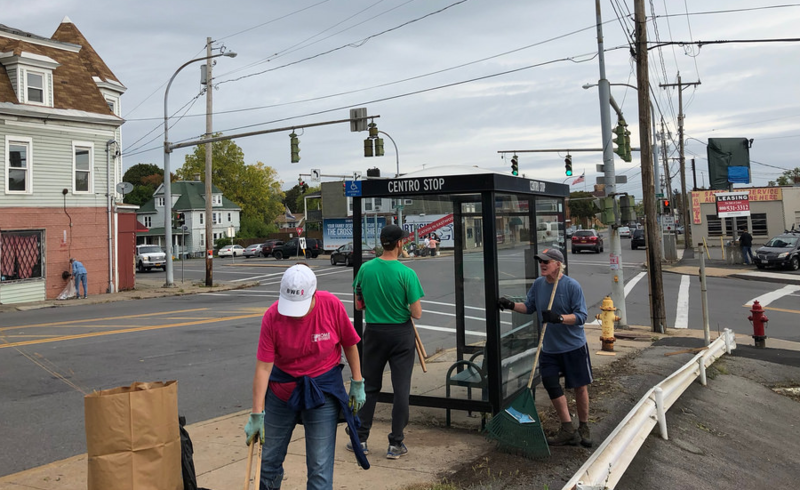 It was her first year at the memorial, although she has spent time volunteering with similar cleanup projects in Syracuse. Hageman had reached out to Dougherty, because she felt finding a way to help was important. By 9 a.m., volunteers were two blocks down the street heading in multiple directions, stretching to Bertram Place off Valley Drive. The sun started to come out after the day had begun underneath gray clouds. One group of volunteers looked different from many of the adults out cleaning up the corners. Lydia Montgomery brought her two sons, a second and a fifth grader, with her to help. In her mind, there was no grander plan: The boys were being loud at 7 a.m., and she figured it was a good idea. Montgomery had attended high school at Corcoran, right down the street, and so cleaning up this particular area meant something more to her. Kirst’s adult son was also one of the volunteers cleaning, something Kirst said he was proud of. In Montgomery’s two young boys, Kirst saw hope. 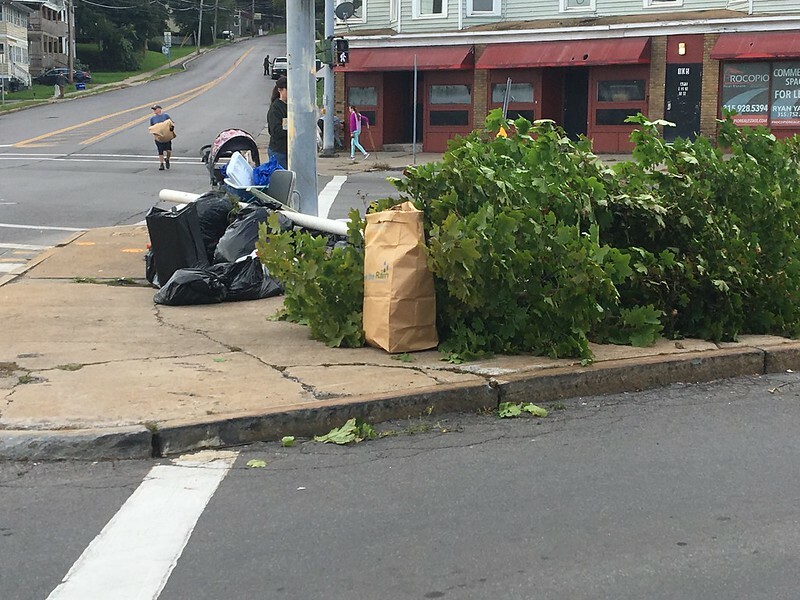 As the garbage was stuffed away, bags were left on the concrete island at one corner of the intersection. More than garbage ended up there, too. In a small, five-foot-wide alley just north of the intersection on South Avenue, lots of weeds and ivy had built up. Dougherty’s brother, Bill, broke out a tall scythe to cut down some of the tree-like growths in the alley. Kirst said remembering Gifford was important. He also wanted to remember what this part of town was like before businesses started to close. There was a post office and a department store, an area Kirst said was “thriving.” When he spoke, there was a level of nostalgia in Kirst’s voice, but also a belief that keeping the neighborhood a little cleaner could go a long way. And as Kirst crossed South Avenue, having cleaned up one corner and heading for another, he paused to look at the cars in the old 7-Eleven’s parking lot. He glanced at the people spread around the intersection early on a Saturday morning, helping pick up garbage. He felt the cleanup represented something bigger than a once-a-year event.